Being a girl.. we wait for one Special day and that is Wedding day. Finally after lots and lots of counting days & imaginations… here blossom arrives as my Wedding day. And whenever the word ‘wedding day’ pops up in anyone’s? mind.. automatically other word clicks and that is “#ASOPALAV”. It is the destination for any girl who wanted to be a dream bride and I was one of them. After roaming around different cities my only choices were fulfilled? by Asopalav beautiful collection. I appreciate their collection, humbleness of staff and way of working for the customers. Selecting this wedding dress from ASOPALAV is more than just a fitting… it’s a process – a memory in the making. Thank you so much. 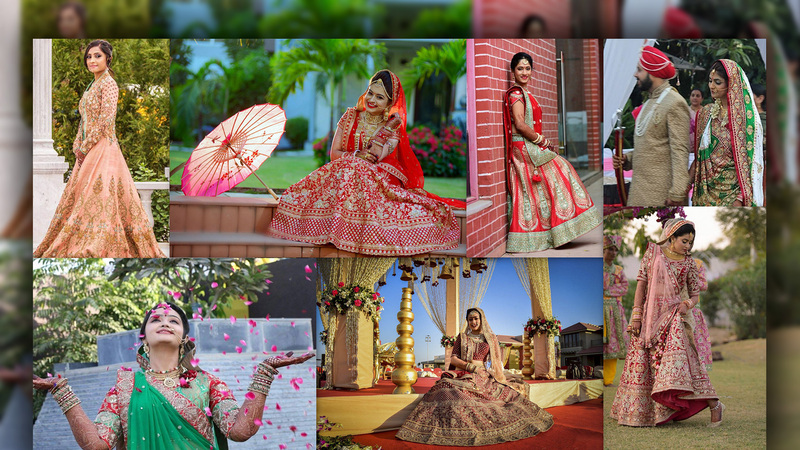 Pooja our happy bride who chose us for her #Sangeet, #wedding & #reception rocks all her #weddinglooks in Asopalav ensembles! #DivyaVyasPandya a captivating bride steals the show on her #dreamday in this angelic Asopalav outfit! Doesn’t she look like a fairytale princess? “To me, clothing is a form of self-expression – there are hints about who you are in what you wear” – Mark Jacobs Inspired by the quote above, I have always been a fashion freak and when it’s your own wedding then as a bride, finding “the perfect dress” is the utmost important part of the whole wedding planning experience! A #family that shops together, stays together! Glimpses from a beautiful #IndianWedding where the whole family was adorned with Asopalav outfits! Asopalav is one stop shopping for all NRIs who come to India for shorter period of time and don’t want to rush or waste time for shopping by going to so many shops. Asopalav is the best place where I get all my designer wear and the staff is so helpful to get what I want. The twirl of tradition, the sacred hues of vermilion and all things auspicious, and a very graceful styling – our sweet bride Jeel wanted all this in her bridal ensemble. We gave her a culturally rich bridal lehenga choli in holy colors of Gharchola – red and green – with very stylish and ornate gold embroidery. Manini Soni, a charismatic #IndianBride who looks ethereal in a gorgeous #red #bridallehenga from #Asopalav! The heritage weaves of a gorgeous #weddinglehenga adorned by our sassy bride Shreya Jani! The vivacious bride, Avani Patel looking like a dream on the #wedding & #reception! Here’s what she has to say : Planning for my big day is rarely the blissful dream girls imagine – but nothing is quite so traumatic as the hunt for that mystical ‘perfect dress’. Graceful bride Bhumi Shah is one of our most celebrated Asopalav brides in the recent times. With her contagious smile and a charming, confident demeanor, Bhumi made for a highly appreciated and followed bride.A modern, classy woman, Bhumi wanted her bridal lehenga to be traditional yet understated. Garishness or over ostentation was out of question! This UK based amazing Indian bride had some things very clear in her mind – when she approached us. She wanted a truly niche creation in subtle shades, but in a very elegant, regal form that’s trendy. Reds, greens and pinks, unlike many other brides, were not on her agenda, but she wanted to keep her feminine side alive, in her special ensemble.